See the description section at the bottom of this page for more information about what is shown on this page. Click the image to return to the index. 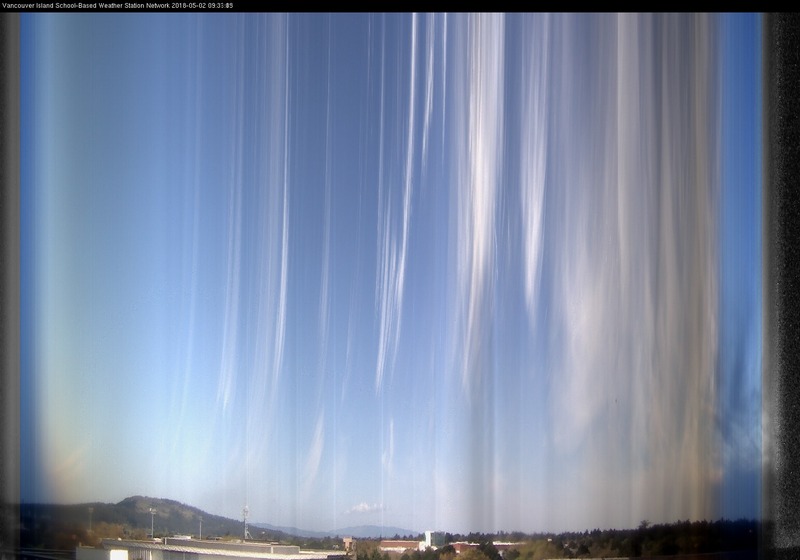 Our UVic Science Building Sky Camera Videos are on Youtube. Keograms were first created by scientists looking at all sky views of the aurora borealis (the northern lights). They are a way of representing the changes that have occurred throughout the course of day in the view of a stationary camera. The way we&apos;ve implemented them is to use the horizontal axis of the image as a time axis. So, we take single pixel columns from the images taken a different times of the day and then recombine to form a new image. Each column of pixels in the keogram represents a different moment in time. Moving from the left to right, the time starts at 05:00, advances by approximately 40 seconds per pixel, and reaches 22:00 at the right edge. Again, the leftmost column of the keogram corresponds to five AM and the rightmost column to 10 PM. The column in the centre is taken from an image midway between those times, obtained at 13:30 or 1:30 PM. Notice the black bars on the right and left of the images. These represent the times before sunrise (on the left) and after sunset (on the right). The width of these bars changes with the seasons as the relative length of night and day change. Because we are scanning across the source images in time and in space keograms made this way don&apos;t reveal every change that occurred in the sky over the course of the day. However, we can use them to make some broad interpretations of the kind of day that occurred. We can tell if it was mostly clear or mostly cloudy. We can detect widespread rain (2012-03-29), snow ( 2012-01-18), or foggy conditions. We can see evidence of smoke in the atmosphere (reddening of the sunrise and sunset times and a brownish tone to the image at others). We can see significant periods of brightening and dimming due to clouds to the south. This is due to the fact that since the camera looks approximately north, clouds to the south, especially in winter, often block the amount of light we see in the camera view significantly. Of course, it&apos;s important to remember that the camera is not using a constant exposure as the light varies throughout the day. Instead it modifies the exposure settings to try to get an optimum picture at all times. Noisy looking cumulus clouds indicate that the clouds were present in the same location for a long enough time to register but were quite dynamic in their immediate appearance. That is, the convection processes that creates these clouds is localized over some specific spot on the ground but the clouds appearance changes in outline from moment to moment. A good example of this is the image from 2012-07-28. Finally, because the camera looks up and to the north at an oblique angle, perspective effects distort the individual images that we see. For example, clouds just overhead or otherwise near to the camera look much larger than otherwise similar clouds far to the north. Motion across the field is exaggerated when it occurs near to the camera, in a way similar to what you experience when you look out the windows of a moving ground vehicle. Objects in the foreground appear to move past your field of view more quickly than objects in the distance. These kinds of effects lead to apparent swirls and upward streaks that we see in many of these images. They do indicate motion of the observed clouds but need careful interpretation. Thanks to Jeremy Krogh, the undergraduate summer student in our lab in 2012 who figured out how to make these images. This page took 14.5 ms to generate. Last Modified: August 20 2018 08:34:54.